The colorful, bright, blue sign outside a unique shop in Discovery Harbour in Midland, Ontario lures visitors into Mr. Chile's Chandlery. This shop has a wide selection of gift ideas which include pottery, jewellery, clothing, books, videos, postcards and many items which relate to the marine heritage of Discovery Harbour. This is one of many shops with an attractive 19th century sign at Discovery Harbour. Most of the historical site is open during the week from the end of May to the end of June and everyday during the summer months. Many different types of tours are available while in Midland, Ontario which allows visitors to see the most prominent features and shops here. Discovery Harbour is located about 40 minutes north of Barrie, Ontario where the British navy and military are highlighted and stories are told about life during this chapter of Canadian history. 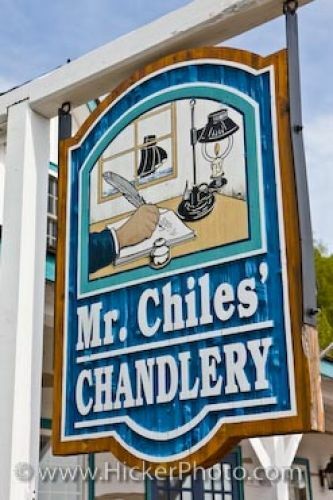 Picture of the sign outside Mr. Chile's Chandlery shop in Discovery Harbour in Midland, Ontario. Sign outside Mr Chiles' Chandlery in Discovery Harbour, Midland, Ontario, Canada.